I like to carry an infrared converted compact camera with me. It fits in my pocket and is great for candid type shots on the go. This Rolls Royce was waiting for the bride and groom, and for me to grab a couple of quick shots before they departed! 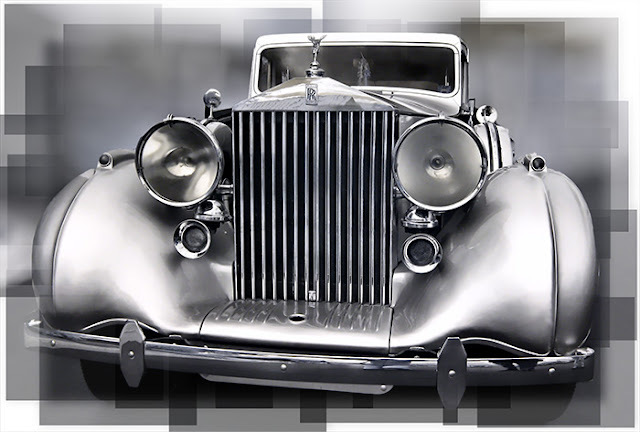 This classic car was photographed in Colorado near the Rocky Mountains, which you can see reflected in the chrome. This compact camera was converted with a standard infrared filter (R72 type). I made a custom white balance setting which created the silvery blue tones in the image. This camera records in Jpeg only. It doesn't have the flexibility or quite the image quality of Raw, but it's a fun camera. My infrared converted SLR camera records in Raw format, also capturing similar tones. Adobe users may notice those tones are altered (introducing a slight magenta cast) when viewing an image in Bridge, Camera Raw or Lightroom. This won't matter for the most part, or if you're converting your images to black and white. Some of my students use a DNG profile for their infrared photos. I use Capture NX2 for Raw conversion for many images in color or infrared.